Does he prefer managing his bills with a money clip vs. keeping in his wallet? He can still carry a wallet for credit cards, Driver's License, and all of those store bonus programs that they require you carry a card for. It does seem to be an easier way to get to your cash. Are there occassions when he is looking to travel a little lighter and leave the wallet at home and just have access to the bills and a single credit card? An instance of this might be when he is out and about, the slopes, fishing, etc. He might like keeping some cash and credit card with him but prefer to leave the wallet at home. 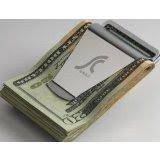 This cool money clip looks like it would be a good solution for those situations.